Mexico’s always been top of my list of places to go when I totally need to chill, and want to do so in a luxury hotel on a gorgeous beach. A recent journey south gave me the chance to do so, as I checked into the newish (opened fall ‘o8) St. Regis Punta Mita for sheer R&R then headed to old town Puerto Vallarta, the region Richard Burton & Liz Taylor put on the map with their longtime love affair. Pairing a few days in Puerto Vallarta (with its cute shops, hip nightspots, great restaurants and unique history & culture) with downtime at the beach in sleepy Punta Mita, to me, is the perfect combination. And while I’ll always have a soft spot for Four Seasons Punta Mita (it’s one of my all-time favorite family resorts with its multiple family pools, tons of connecting rooms and amazing kids’ club), the 120-room St. Regis Punta Mita stands out at the destination’s newest star. Sitting on 22 acres between two Jack Nicklaus golf courses overlooking the Pacific Ocean, the stunning resort features 24-hour butler service, a 10,000 square-foot Remede spa and three infinity pools--including one for adults only. Rooms are housed in traditional Mexican casitas, and offer a minimum of 600 square feet, while outdoor showers, huge bathrooms, ocean-view patios and a chic Mexican-meets-Mediterranean décor all add to the overall appeal. Beautifully designed, residential-style beachfront suites range up to 3,100 square feet and have up to three bedrooms, private pools and plenty of space for oceanfront entertaining. Mexican breakfast at Las Marietas is a delightful way to start the day, while the best way to wind down is over cocktails and a delicious meal in Carolina (named for Caroline Astor, founder of The St. Regis New York). Side note: While in Punta Mita, be sure to check out the nearby surftown of Sayulita. Save room for homemade smoothies at one of the funky cafes (my faves are Rollies and Choco-Banana) and bring pesos to shop for handmade silver jewelry. Only an hour away by car but within a totally different world, sits Puerto Vallarta, home to one of my favorite hotels, Hacienda San Angel. This charming gem of a property sits on the site of the original “Villa Bursus”, a gift from Burton to his then wife Susan (thus the name Bur-Sus). Over the years, owner Janice Chatterton has expanded this Small Luxury Hotels property to comprise five gorgeous Mexican villas featuring 14 unique, antique-filled suites. 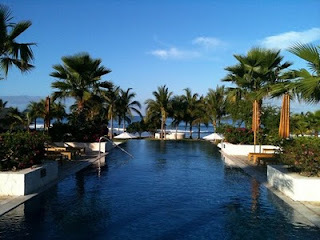 There’s an amazing gourmet Mexican restaurant with Bay of Banderas views and three heated pools on property. Plus, all rates include a fabulous (and free) in-room breakfast delivered by one of the ultra-friendly staff who treats you like an old friend (and you will be by the time you leave!). You’ll especially love this cliff side hotel three blocks from the Malecon if you’re a dog lover like me, as Chatterton is a major supporter of the local ASPCA. Her adorable rescue pups even serve as the hacienda’s official welcome committee. Not topping everyone’s list, but also very worth a visit, is the country’s capital of Mexico City. Just a quick flight from Vallarta, this city of 22 million-plus is captivating to say the least. The Saturday afternoon bazaar in San Angel, a visit to the Diego Rivera/Frida Kahlo house, an afternoon at the rodeo and visits to the fabulous Archaeological Museum and the Franz Mayer museum are all must do’s if you’ve got the time. And if business brings you this way, you’ll love the centrally-located St. Regis Mexico City, which just opened six months ago. Sleek and chic, with spacious butler-serviced, high-tech rooms, and an eager to please staff, the hotel offers a warm, welcome respite from the bustling city. Also brand new and fabulous is Las Alcobas, an ultra-swanky boutique hotel located in the hip and happening district of Polanco. Nice piece Stacy. All mentioned are lovely hotels and glad to see Hacienda San Angel was one of your favorites as well. One that has also been in the LMG portfolio. We would love you to consider a link exchange.